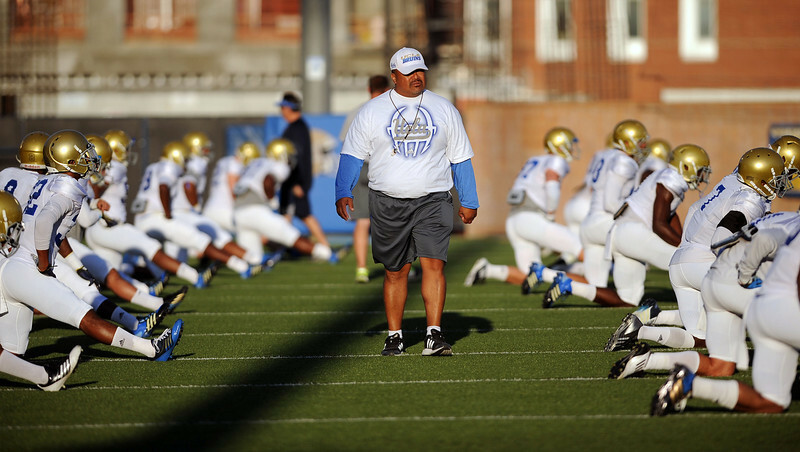 Officially, Mike Tuiasosopo is in charge of coaching UCLA’s outside linebackers and special teams. Practically speaking, the latter role is more muddled. Back in April, head coach Jim Mora said that his newest assistant coach was “still feeling his way through special teams.” Under former linebackers coach and special teams coordinator Jeff Ulbrich, the Bruins became one of the best kick and punt return coverage units in college football. Tuiasosopo doesn’t have that type of resume. According to Tuiasosopo himself, special teams is still coached by committee. (In training camp, new running backs coach Kennedy Polamalu has been the most vocal assistant during kick and punt returns.) He credited the work Mora and Ulbrich — now UCLA’s defensive coordinator — had done to establish a strong foundation. Tuiasosopo also pointed out the experience that the Bruins had on special teams, where veterans such as linebacker Ryan Hofmeister, fullback Taylor Lagace and running back Steve Manfro have helped the 50-year-old learn on the job. Maybe it’s my brown-colored glasses affecting my view, but it looks to me like he doesn’t have much experience coaching special teams (I think one season of high school ball) and is relying on the players themselves and other assistants to get things done. This area has suddenly become a potential weakness, with no punter in place yet and a 3rd-year kicker who still has to prove himself. They all need to get their acts together, or any hopes of a possible playoff spot will go up in smoke early in the season. On a separate note, nobody seems to be concerned about the Texas game at a “neutral” site, but that is essentially a home game for the Longhorns, and Charlie Strong will have that team pumped up for the chance to prove themselves against UCLA. It should be a big test for the Bruins, and I hope they’ll be “up to the task”. No one concerned about Texas because they have a date with Virginia Cavaliers first. It’s away and early morning game. Last time we have early morning game like this, the team was walking around like zombies in the 1st quarter before they woke up halfway in the 2nd quarter. I agree that they need to focus on UVa and first. I was just referring to chatter from the media about UCLA possibly earning a playoff spot. The writers all consider the Oregon game as an obstacle, but they seem to be overlooking Texas, especially in light of UCLA’s struggles on the road. We always seem to play Texas well on the road, though. Probably better than we play them at home.